Due to some misfortunate happenings, the quarantine of Worf and Data ended and we got to know each other. They moved in the living room, their room close to mine, temporary placed on an armchair. On the other hand, Worf seems all shy and very aware of his position. So I might even get to become friends with him. I like a lot that he already understood the importance of wheeking when the time comes. I mean breakfast / dinner time. He even gets to produce higher sounds than I, so he may become a very important ally in my daily struggle for food. I’ve also noticed he likes to rise himself on the back paws and analyze the world from there. But not everything is perfect… I’ve heard the humans talking about visits to the vet, the human female checked us all thoroughly and she seemed upset the whole Sunday. I’ve eavesdropped and heard her saying that Worf and Data might have some skin condition and she should take them to the vet. To my understanding, if this is true, we will all have to take medicines and I really don’t like this. I hope we will all be fine and that my fur will stay perfect as it is. By the way, I really like the appetite of these two new piggies: they seem decided to produce as much damage in the vegies stock as possible. It is a nice attitude and I’m proud I have companions in my quest. But there will be a lot of work to do to teach them how to pose; especially that Worf has very dark eyes on a very dark fur, so difficult to catch well. Also, thanks to all gods that Data has pink ears and Spock has them grey, otherwise in few months the humans might have confounded them. Not me, I’ll always recognize Spock, no matter what. 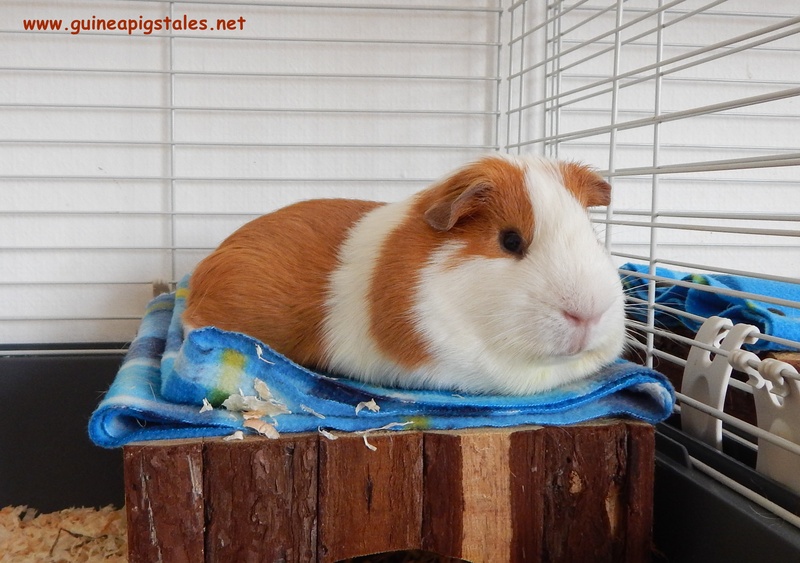 I’ll talk to Spock to see if we should invite the little piggies to write a guest post. Just to check if they are capable and if you like them enough. After all, I do not wish to alter our chances to become famous. And most probably tomorrow Spock will share his opinion about Worf and Data. But I’ll show you below some snapshots with them. And one with me, of course. And the not very photogenic Worf. Still I must admit he has funny colours. So, that’s the reason why we have humans to serve us. For example, our human female already knows her way in the bloggers world (true, only in Romanian) and we are still not sure we can fully trust her, but for the moment we gave her also the task of taking care of our “public relations” section. Now, don’t get me wrong: we still read the blogs with and about furry friends, but it’s better that she goes and visits the beauty blogs and other interesting virtual homes. I have no interest in make-up, for example. Or IT… Or poetry… But she does. We just need to keep an eye on her to make sure she still goes to work and earns money. So, if you get “likes” and comments from a lady called MM, it’s our human female. Of course, she is not allowed to put a link to her own blog (nobody understands her mother tongue! ), nor to speak on our behalf. Until the present moment, we couldn’t find any suitable activity for the human male. 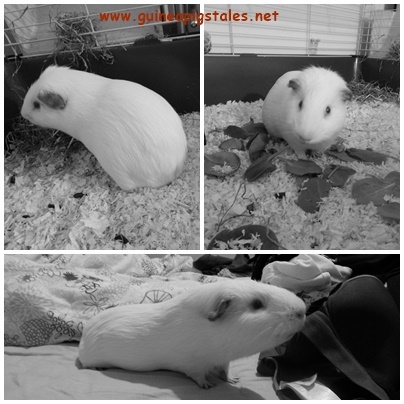 Except the one of buying the 20 kilos packs of sawdust, but last time he went to the pet-shop for this he came back with two other guinea pigs… And this is not because he has no skills, but because he has moods: sometimes he accepts gladly to do groceries for us, sometimes refuses and the human female must carry a lot of vegies all around the city. So, how could we give him important tasks regarding our careers? Conclusion: keep in mind that MM is our delegate in reading your blogs, although she hasn’t have the time to pass-by daily. And thank you for visiting us. Now I should go back to sleep. Or maybe popcorning. Or better pooping… Tough life! So, Spock already told you how busy our human female was on Monday evening. I was also utterly unhappy about being put aside for two hours, but I hope this mess will end at some point and I’ll get to train the new members of the gang. 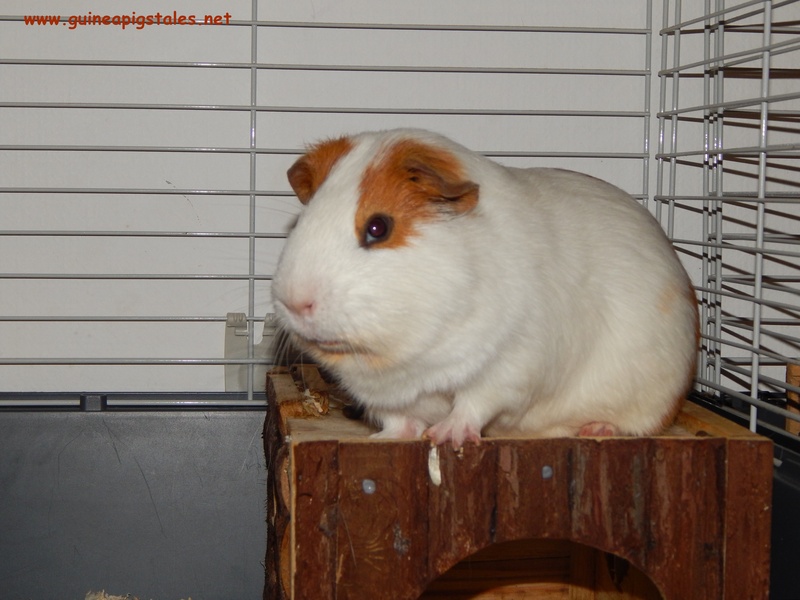 Anyway, I forgot why I was upset when the food landed in my cage: parsnips and carrot greens! 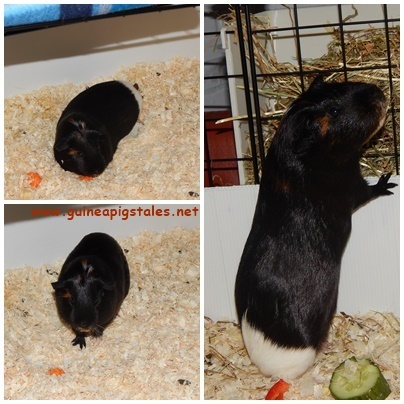 I’m not very fond of the first one, but the carrot greens are very tasty and full in vitamin C. Eating took me a while and the human female must have been felt like sleeping already, so she came and started to pet me while I was chewing. I’ve stopped for a second trying to decide if I should continue eating or stretching and spoiling myself. But it stuck me I could do both. So, I’ve “fluffied” my but in the sawdust and let her do her thing. I was wheeking with pleasure and chewing with the same amount of pleasure on the same time. And I realized I’m that close to Napoleon who could do three things on the same time… Exactly when I was being sorry for not finding a third stuff to do, I felt like pooping. And there I was: wheeking, pooping and eating on the same time. I’ve told you I’ll be the next Napoleaon! Yesterday it was a very busy day for our human male: two parcels arrived during the morning and in the afternoon he went out and came back with some large sheets of some kind of plastic. I had no idea what are they planning, but I told myself that we (I and Kirk) will definitely find out at some point. The human female arrived as scheduled, around 18:15, this Monday being one of those days when she had nothing else planned after work. I saw her and I immediately started to wonder what’s for dinner. Kirk was not only wondering, but he put up his show also, running around and wheeking very loud. He begged all day the human male to give him pellets and now he was asking for vegies. But… She did a very outrageous thing: she took some fennel leftovers from me (I never finish my vegetables) and gave it to Kirk and then, completly ignoring us, started working on some kind of a puzzle. She took out from one box some wire panels and build fences and after that made a box from a plastic sheet and tried to put it inside the fence. Anyway, she spent two hours doing this and I was annoyed. And Kirk became very noisy. Only after she finished the whole construction and put it in the bedroom, she came back to us, did the cleaning and fed us. LE: Data looks almost exactely like me… I wonder if he is as crazy as I am. I am so happy and popcorning because this is our first nomination among the bloggers and coming from a human it’s a sign that they also read some Guinea Pigs tales and they recognize our wisdom. It was Spock who saw the nomination, but he became even more active and he delegated me to answer the questions and to pass on the nominations. So, let’s get to business. Do you drink? What is your alcohol preference? Yes, we drink water. Apparently I don’t drink too much, but Spock is a master. Also, he tried some mint tea and some beer, but he was not pleased with the tastes. If you were a tree, what kind would you be and why? If I were a tree?! May I be a celery tree? Yeah, I know, it doesn’t exist, but… May I? No? OK, I would prefer to be a very big and wise oak. And please keep your dog away from me. Spock will never be a tree because he can’t stay still long enough. Do you have houseplants? Why? Why not? Do the vegies that we eat count as houseplants? I mean they stay in the house with us or one or two days… And the humans are watering the celery to keep it fresh. Oh, we had once some grass especially cultivated for us, but we eat it fast. What was the last major goal you met? When I weighted 1 kilo was a great moment. But when I passed 1.3 kilos was also awesome. And now I’m trying very hard to overpass 1.4 kilos. For Spock it was last Monday when he managed to stay for more than 2 minutes in the lap of our human female to be cuddled. Glorious moment! Do you consider yourself environmentally conscious? If so, what measures do you take? Yes, for sure! For example, I don’t waste food: I eat everything, including what’s left from Spock. And we are using sawdust as bedding, which is put in the trash and burned to produce energy. Spock recycles paper and cables. Oh, tough question! Because we like to write and because we think humans should smile from time to time. And because resistance (to our cuteness) is futile! What’s the most interesting place you have visited? The kitchen. There are a lot of vegies in there and when the humans are not around, I can help myself. For Spock is definitely the hay bag. Given the opportunity, would you travel to space? Yes! But only if I can take the whole crew with me. I would never travel without Spock, Worf and Data. Although I don’t really meet the last two yet, they seem reliable and ready to bim up. Engage! If you could make a documentary about one topic, what would it be? Oh, it would be about how humans can spend hours watching us. Our humans consider us a kind of a TV… Actually, no longer than yesterday I had a conversation with the human female trying to convince her to stop taking snapshots while I was eating under the coffee table. Do you plan on making contributions to change the world? How? Not only that I’m planning, I really do it! How?! I help lowering the blood pressure of some bipeds. And I make them smile and more relaxed. I think I’m doing a pretty good job! Now, let’s nominate some blogs also. 🙂 I’ve done some research on the Internet to check for the rules of this award and it turned up I should pass it to no less than 3 other bloggers. 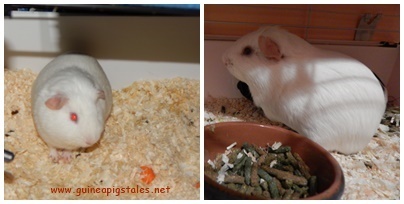 As we are very busy piggies (sleeping, eating and tearing apart the house is a full-time job! ), we don’t have a lot of time to read other blogs, so we don’t know too many other bloggers. But we came up with a list and I kindly ask the nominees, should they accept the award, to pass it to other bloggers and to answer the 11 questions mentiond in our post. Sophie and her lessons – we find it very inspirational. Humans, we thank you again and don’t forget to smile today! First of all, I would like to thank you for your nice words and attempts to reassure me my humans will still love me. I’m still a little bit scared, but I have a lot of things to think to so there is no time to actually panic. Also, Kirk seems OK with the situation so the atmosphere here is fine. We are both confused, but for the moment there is not much to be done. But there is much to plan… Our humans are agitated and especially the human female is very busy searching for solutions for bigger cages. I understood that they wish to relocate us also. Actually, yesterday evening they had a very funny conversation on the couch, very close to my sleeping ears, trying to come up with ideas for the placement of our rooms. 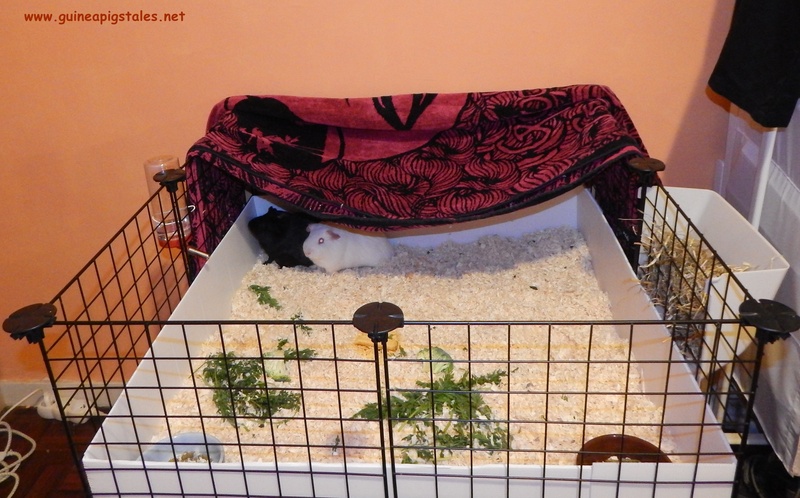 She claims it won’t be fair for Worf & Data to share a cage as big as one of ours because they are two. I kind of agree with this but I want to make it clear that I’m not giving up my room. Only if it’s for a bigger one. So, they’ve started to virtually move the furniture in the house and find space for all of us to live together and the conclusion was that they should check how comfortable is the entrance mat because that may be the only available spot for them. So, our humans are very busy coming up with solutions and I totally understand: I shared the very small cage with Kirk when we were only 2-3 months old and it’s too small. 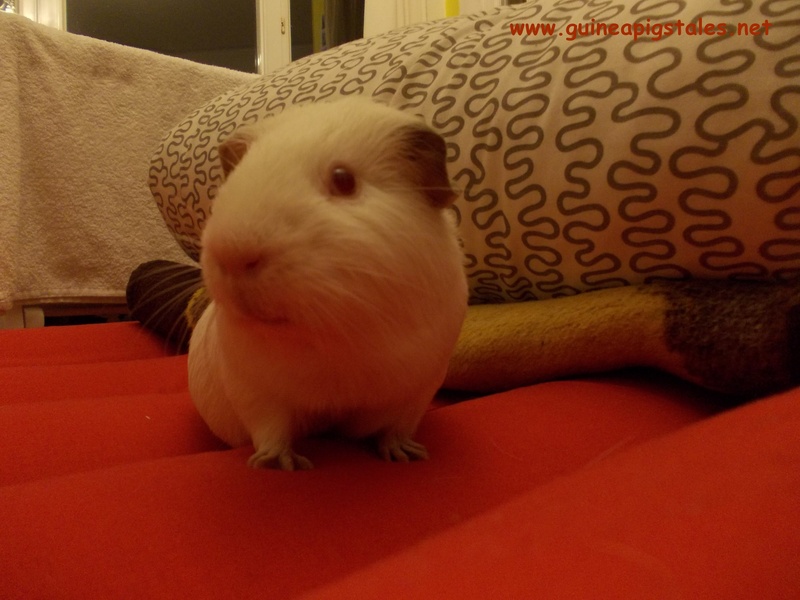 I don’t even know why they sell that in a pet shop as a room for Guinea Pigs… But we are also busy thinking to this blog. When we’ve started it two months ago, we were alone. Now we have two new potential buddies, that we have never seen or talk to, and whom might be willing to join our initiative also. Than we should change the name because “The tales of Kirk and Spock” will no longer be appropriate. Maybe “The Star Trek gang” will do the trick. But this depends a lot on if they want to be part of this or not. And we won’t be able to talk to them and see if they can really write for another 38 days. So, we’ve got a problem! See?! We are very busy pigs! 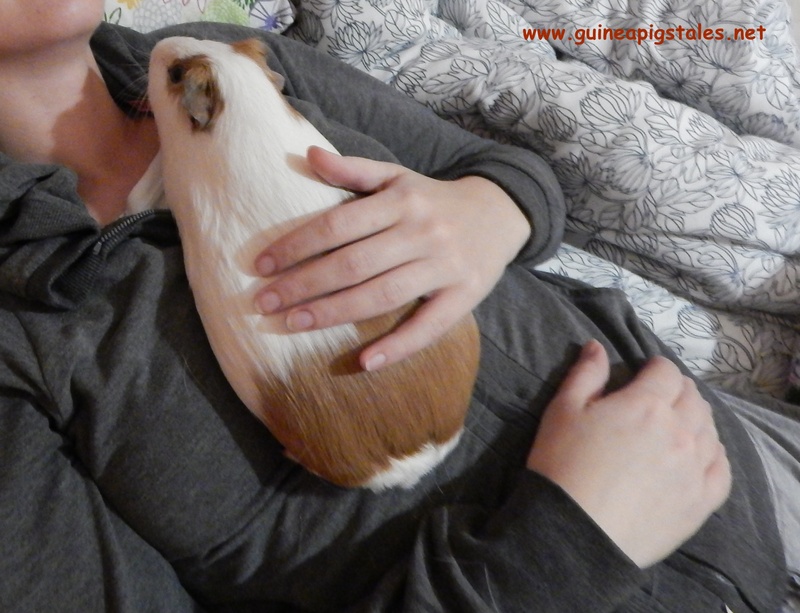 The other day I was enjoying a cuddling session in the bedroom with the human female. The human male was playing backgammons on the Internet and I can’t stand the noise of the dice. It remembers me of something , but I don’t know exactly of what… Maybe I should pay a visit to the shrink because that noise makes me purr in a very annoyed way. At some point the human female realized her conversation partner heard every bit of noise I was making. She apologized and explained my presence in the room, but the other guy didn’t seem very convinced. And I’m pretty sure he wasn’t, because he never called back. But my human doesn’t seem very upset… How could she be when I look so beautiful? !